Which Trailer Brakes do I need? I talk to many customers who really aren’t sure which trailer units they need or what type of brake system they should have. What will I be hauling with my trailer? 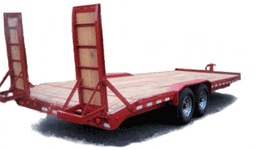 What weight trailer will I need to haul my max load ? Is my truck set up for electric, air or both ? Do I plan to upgrade to larger equipment in the near future? Do I have a hitch for gooseneck, bumper pull, or semi? Are there special needs I need to consider, such as color, larger toolboxes, extra width, length etc...? All these questions you should discuss with your dealer or factory representative, who will not only help you answer them, but design the perfect unit for your needs. If you are not happy with electric brakes for example, you might try electric over hydraulic disk brakes. Air brakes are available on 10 ton units or above and can be upgraded from an electric unit.